And I saw that expression, live! While it may not have been Anton Ego himself or anybody close, I had the privilege of seeing that expression live. He wanted to kiss the chef! Suddenly we almost wished that we had Nonnas as grandmas! Great chefs talk about connecting with the food, but once in a while, the food connects, transports and leaves you hanging. Rarely. But it happens. Chef Alessandro's Balsamic Gorgonzola risotto did that and more. For me, seeing two people cry over food was a first. I'll be honest, I loved it, but cry? Not me. Not yet, at least, but it was a privilege to watch it unfurl in front of you! So, what's happening? Like most places, Focaccia at Hyatt Regency has flown down a guest chef, their Italian chef at Grand Hyatt, Mumbai to come in and shake things up here. I mentioned how I missed Chef Roberto in one of my previous posts, but this guy is at another level. You can either go for their 4 course meal with 2 glasses of paired wines for Rs. 3k or go a-la-carte. Our drinker friend wanted the former and the chef is so accommodating that he prefers to give you a sampler of starters. So instead of getting two starters, I'd definitely recommend taking the chef's platter as it comes at no additional cost as part of the set menu. A fab beetroot ravioli, stuffed rolled chicken, some nice salmons were part of the fabulous platter that had two of each. If you are three of you, it will have three of each. Great start. Nothing prepared us for the onslaught. The risotto arrived looking no-so-innocent. It could pass off as chocolate risotto, courtesy its colour. Normally, for me, the bite, that al dente texture is the first thing I want to notice in a risotto, but all that was out of the window. One spoonful and emotions came flowing down! Flavours were unique and the gorgonzola cheese was starting to take over from the balsamic reduction. As the rest of the subtle flavours came to the tongue, finally I noticed that the risotto was indeed as texture-ful as it was flavourful. With flavours like that, nothing else should have mattered, but it was mastered to the extent it should have been. 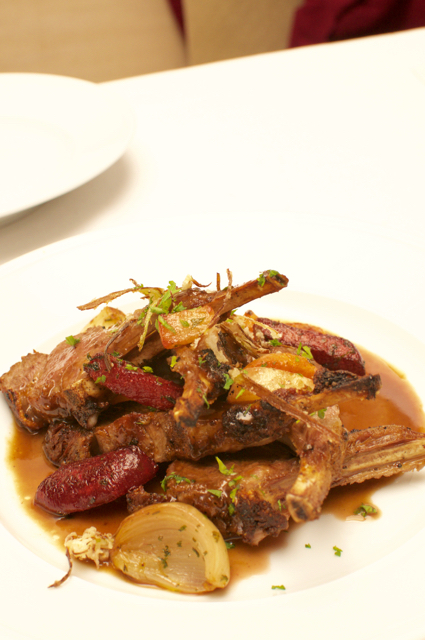 The third course, the lamb paled in comparison to the first and second courses. 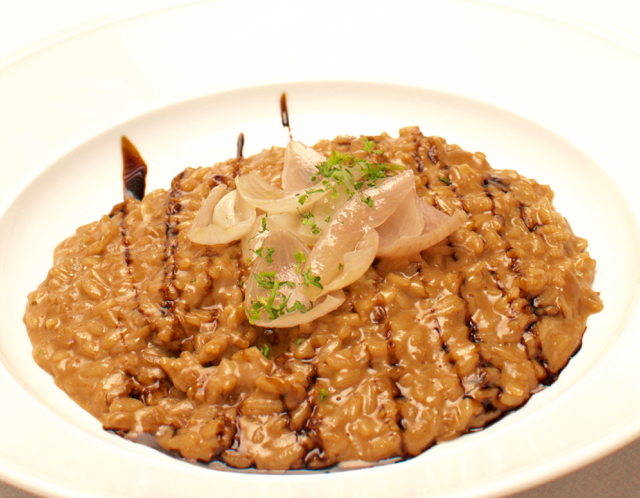 We would have happily skipped a course in a four course meal for risotto like that. Heck, I would give up eating meat for the rest of my life, if vegetarian food was that yummy! Dolce! Didn't disappoint. While we expected some tiramisu of dancing panacotta, the dessert was a chocolate brownie type thing. 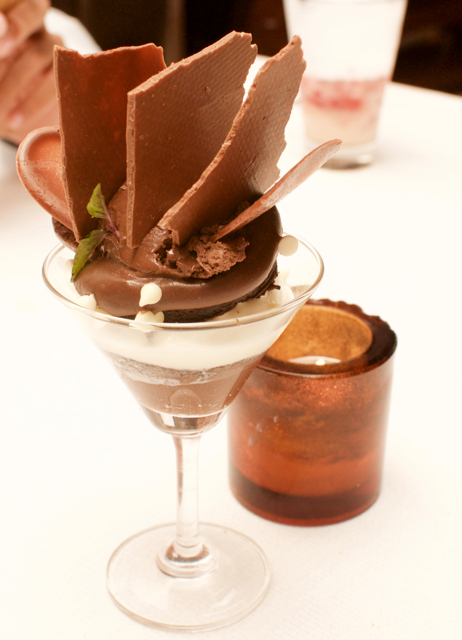 Four textures of chocolate with cream. It was yum, but would have liked the risotto as dessert. 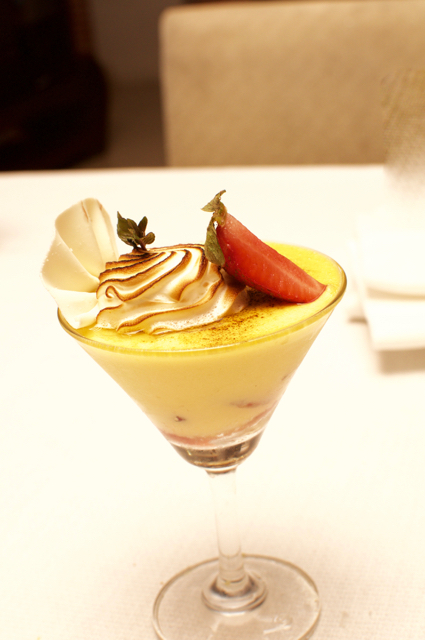 The strawberry merengue was nice, but I would have liked the risotto as dessert. I would have had the risotto as first, second, third, fourth and next day breakfast if I could. For the first time, I tried having espresso. 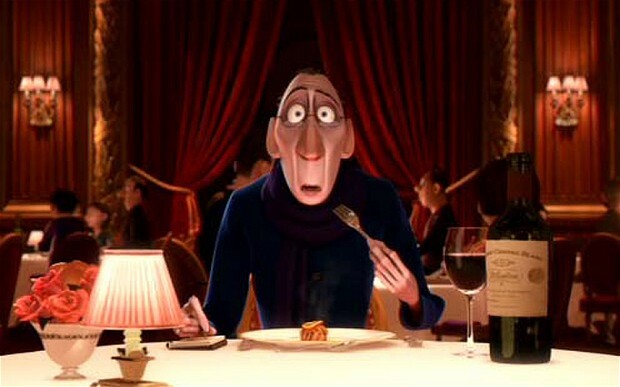 That is one taste that I am yet to acquire and I thought a great italian meal mayn't be a bad time to try it. I didn't like it, but I couldn't stop drinking it! A feeling that was so unique and had nothing to do with the restaurant. 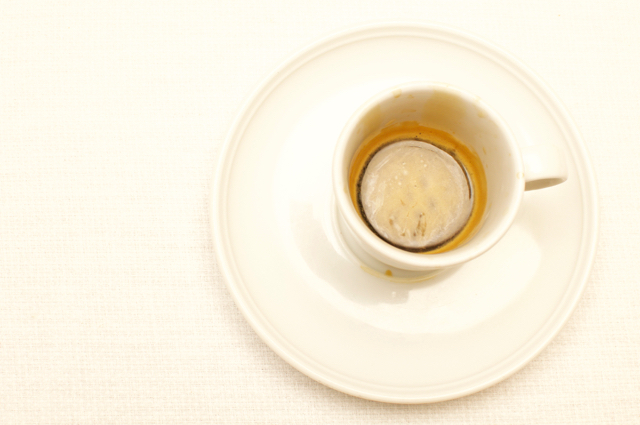 I believe I may soon be a fan of espresso, coffee in its purest (sort of) form! 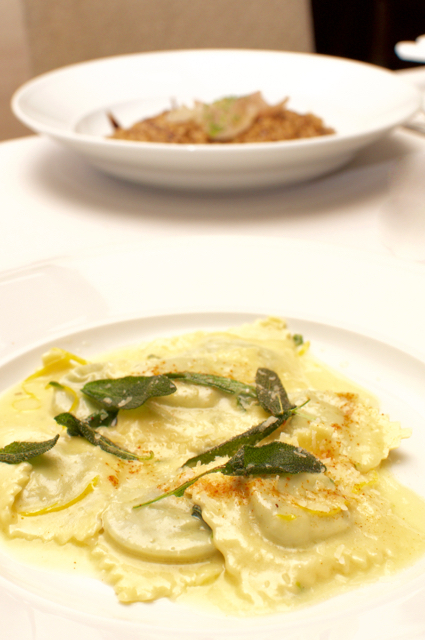 Chef Alessandro has been in India for about 6 years and says he loved Mumbai. 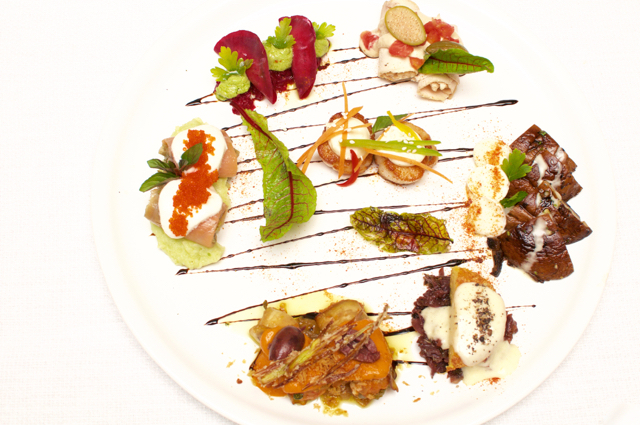 Previously with the Italian restaurant at Venetian, Las Vegas, he has brought a small part of Italy with him to India. Wonder how he fares in home turf at the Grand Hyatt, Mumbai. Unfortunately he is here only for one more day, Sunday 20th March!